Monte Carlo Weekly Photo: Good for the thighs! Slightly blurred photo today - just I wanted to show you why the locals are so fit! 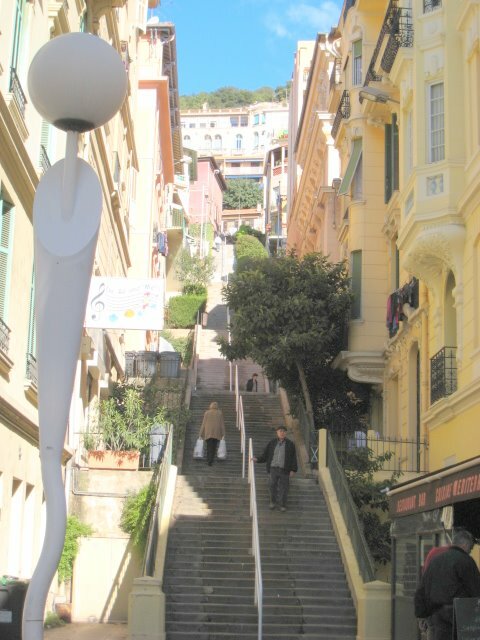 In Monaco (one street below) you will find steps too, but you'll often find escalators and lifts as well going from one level to another. Here in Beausoleil it's necessary to walk up those steps with the shopping bags. Whew, I am tired just looking at all those steps! Believe I would have to take the escalator! You live in a beautiful, scenic place. gorgeous...but again, all those steps! Oh, my! I suppose the people of Beausoleil don't have much use for a gym. Strong legs and strong arms! Jilly, I'm so dumb - I just realized that you are posting Monte Carlo and Menton DP blogs, quite a task!!! Can you bring some of that sunshine to New York City? We need some sun and heat. elevated buildings in the city always make the place seem more fascinating, I love it ; not the climbing it though! marvelous!!! I love steps - here in the islands, I like to go running up this place that has 1040 steps - sttep steps - I will have to visit this wonderful place one day!